Feelings of restlessness are common for seniors during the colder months – if you’re itching to change things up this winter, there are many creative activities you can do comfortably indoors while the snow falls outside. From imaginative crafts, to mouthwatering recipes, to productive projects around the house, here is a list that is sure to keep you occupied and inspired. With temperatures dropping, stay comfortable inside with creative, crafty activities. Introduce a colourful, warm glow to your home with Watercolour Luminaries – they’re also a great way to reuse tissue paper left over from holiday gifts! Or, play around with aromatherapy by making festive Cinnamon Orange ornaments or fragrant Herbal Sachets. Snowed in right before your weekly aquafit class? Fortunately, there are plenty of how-to guides and video tutorials on the internet about easy and light exercises you can do at home – no equipment necessary, except maybe a chair. You might even want to put on your favourite tunes and dance up a little sweat! Not only is dancing fun and good for your body, it’s great for your mind. Before you get started, best speak with your doctor about your activity levels to prevent injuries. Winter is the perfect time to sort through your closets and shelves to purge excess clutter and organize your belongings! There are few advantages to organizing your home – you can reduce your fall risk by reducing clutter, contribute to the community by donating unwanted items, and bring about opportunities to rearrange and redecorate. Your home will feel refreshed and renewed when you consider our simple tips for decluttering this winter. Put good use to your kitchen this season by trying out a few new recipes. Pay tribute to the flavours of Canada in winter with a bubbling pot of West Coast Fish Chowder, a stick-to-your-ribs helping of Bacon Apple Cheddar Loaf, or a sinfully-sweet plate of Nanaimo bars. Your neighbours and loved ones are sure to flock to your home once they discover what you’re cooking up. Did you know you can still enjoy the beauty of nature through the harsh winter season? Take up bird watching and stay entertained all day long by the fluttering and twittering of Canada’s vast and varied bird population. Build an easy DIY bird feeder using household items, and fill it with birdseed mix from your local grocery or pet store. Ask a loved one or your caregiver for help hanging your feeder outside your home’s window. Chances are that over time your feeder will attract returning customers, so consult Audubon’s Guide to North American Birds to identify your frequent fliers. While seasonal crafts are always a great way to engage grandchildren during a visit, consider changing it up and doing something educational. Play around with chemistry by growing your own Borax Crystal Snowflakes. Learn some easy card tricks that will make your grandkids smile with awe – then spoil the mystery and teach them how it’s done! Or, put your heads together to solve these tricky riddles and brain teasers. 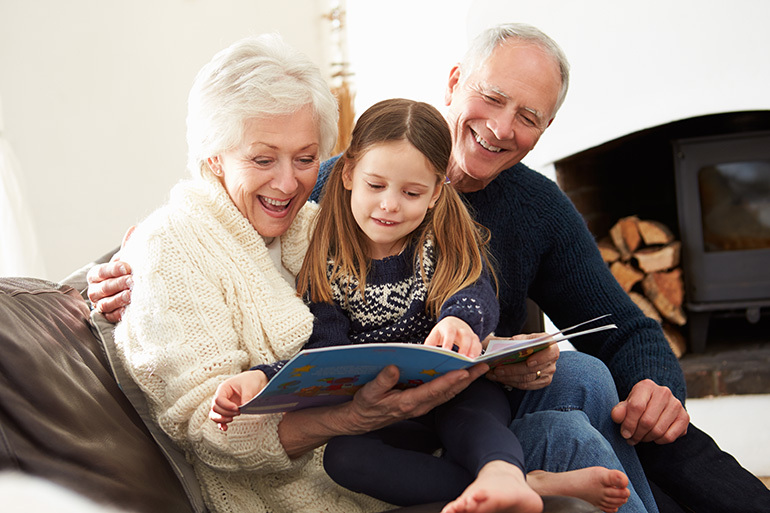 You and your young grandchildren can benefit from cognitive exercise, not to mention it’s a great way to pass the time indoors this winter. With the winter season keeping you indoors, you may have noticed that you could use an extra hand with your daily tasks around the house. Maybe you need help preparing your meals, gentle reminders to take your medication, or you simply wish someone was there to share opinions on today’s events. We can help you get started – call us toll-free at 1-877-289-3997.